In the words of the great American poet Henry Wadsworth Longfellow, “The best thing one can do when it’s raining is to let it rain.” Here at the Machaneh (camp) we roll with the rain as well. Despite nature’s twists and turns opening day registered “Off The Charts” on the Fun-O-Meter. 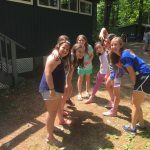 While parental figures weaved in and out in the Tzrifim (bunks), the many chanichim (campers) played some energizing name-games. With the pockets of sunshine we were given, all of Gurim (lion cubs) took an entire tour of the Machaneh and got into the Agam (lake) for instructional swim testing. When it did in fact pour we switched gears and made the most of i t by playing seven different games simultaneously in the Ben Zvi building. In conclusion, some parents had raindrops on their faces, but as soon as they were gone and the games started, the chanichim bore sunshine smiles! Another wonderful opening day here at the Machaneh!